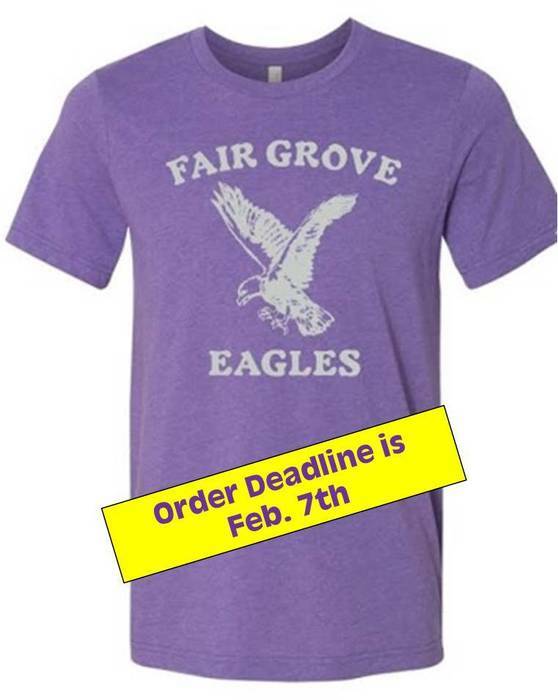 Fair Grove R-X EaglesOne School. One Community. Every Child. Our HS softball game scheduled to be played on 4/25 vs. Forsyth has been moved to today, 4/24. This game will be played @ Forsyth on their turf baseball field if the softball field is not playable. The baseball and softball fields sit right next to eachother. The varsity game will start at 5pm and be followed by the JV game. The HS softball team will be dismissed from school at 2:30 and their bus will leave at 2:45. 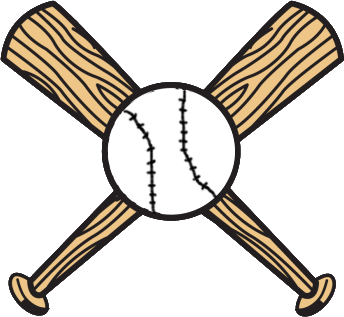 Our HS baseball game scheduled to be played @ Seymour on Friday, April 19th as part of the Strafford Wood Bat Tournament, HAS BEEN MOVED TO FAIR GROVE. The varsity game will start at 4:30 and be followed by the JV game. 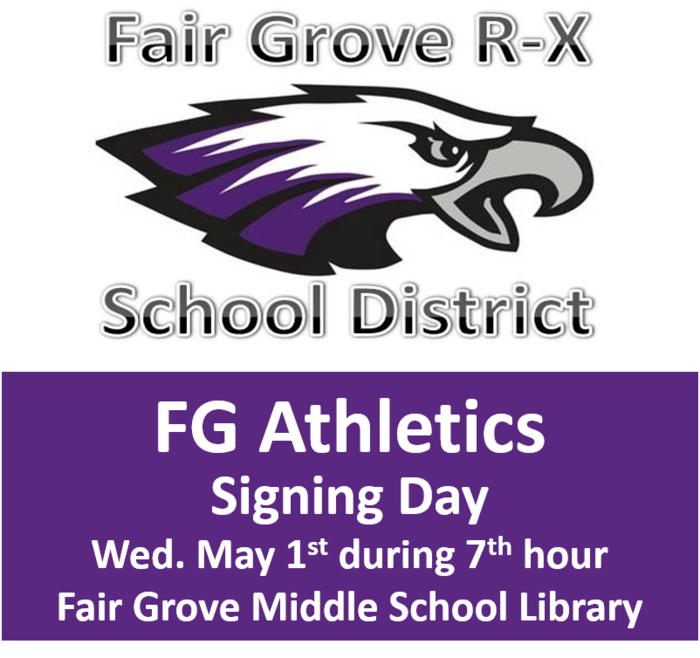 The signing day for current seniors who are going to play a sport in college will be Wednesday, May 1st during 7th hour. 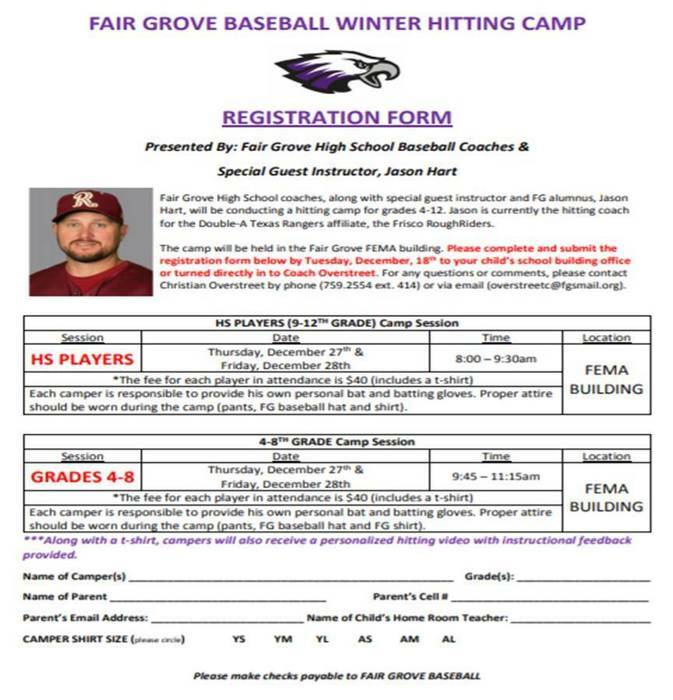 Any student-athlete who is planning on signing needs to notify Coach Overstreet as soon as possible. Our JH softball game that was scheduled vs. Pierce City on 3/29 was canceled due to wet field conditions. We are scheduled to play @ Pierce City on 4/25 for our last game of the season. Instead of playing one game, we will play them in a double header to make up the game from 3/29. Tuesday, April 25th - JH softball @ Pierce City Game 1 will begin at 5pm followed by the 2nd game. 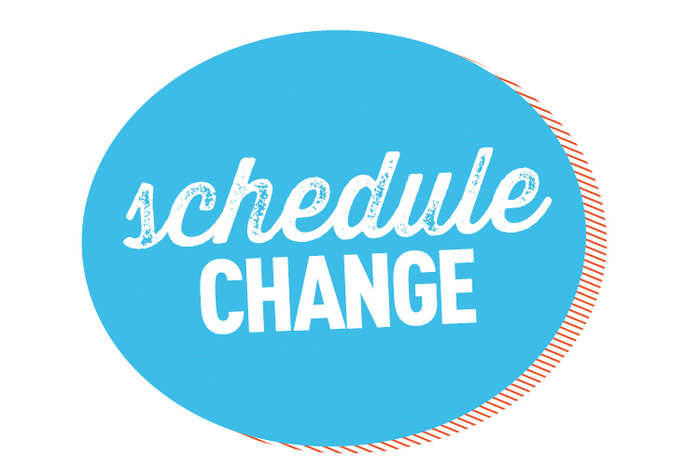 Our HS baseball game vs. Forsyth originally scheduled to be played on Thursday, has now been moved to Wednesday (4/3/19). The varsity game will start at 4:30pm followed by the JV game. There is a strong chance of storms on Thursday so we are making our best effort to get this game in without having to reschedule it later on in the year when you lose a lot of dates. Our HS baseball game scheduled for Tuesday, April 2nd @ Seymour has been moved to Fair Grove. The varsity game will start at 4:30 with the JV game to follow. The freshman boys basketball tournament at Mt. Vernon has been canceled for tonight. A make up date is TBD at a later time. Project Grad will be auctioning soccer balls signed by the 3rd in State Fair Grove boys soccer team on Friday, February 1st at the basketball game. 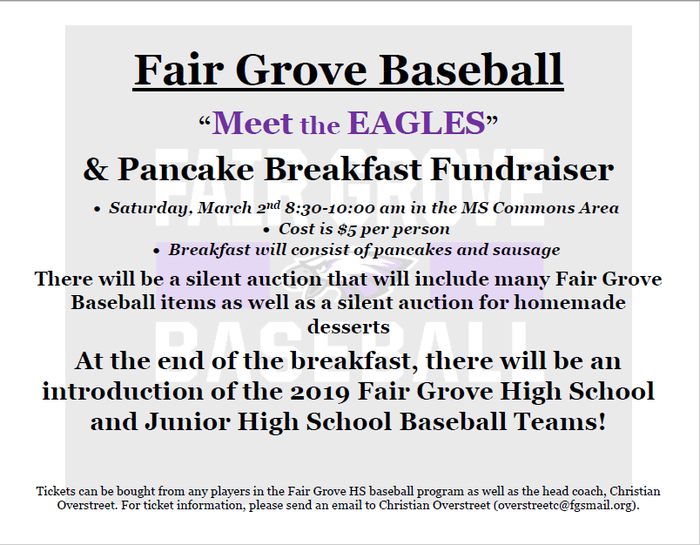 Please plan to be there for your chance to own a piece of Fair Grove School history. Due to the threat of inclement weather, the JHBB tournament at Strafford on Saturday, January 19th has been canceled. 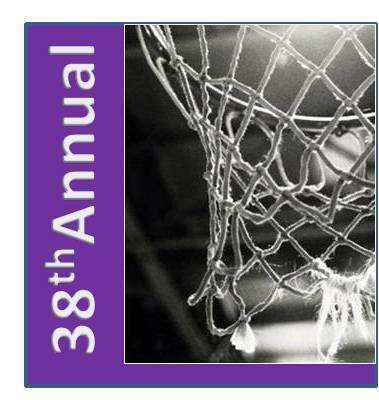 This tournament will be made up on Wednesday, January 23rd and Wednesday, January 30th. Make up schedule for the Strafford Tournament: Wednesday 1/23 8th grade Strafford vs Catholic @ 5 PM Marionville vs Pleasant Hope @ 6 PM Clever vs Ash Grove @ 7 PM 7th Grade Pleasant Hope vs Marionville @ 5 PM Clever vs Ash Grove @ 6 PM Strafford vs Catholic @ 7 PM Wednesday 1/30 8th Grade Consolation @ 5 PM 3rd Place @ 6 PM Championship @ 7 PM 7th Grade 3rd Place @ 5 PM consolation @ 6 PM Championship @ 7 PM Fair Grove is not listed to play on 1/23 because we have already played our first round games this past Wednesday. Our game times for 1/30 will be determined once the games on 1/23 have been finished. 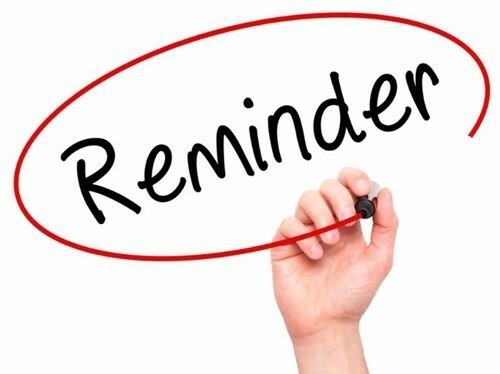 Due to the lack of make up dates available for both schools, our JHBB game vs. Hollister that was canceled due to winter weather on 1/11/19 will not be made up. Our HSBB game canceled on 1/11 will be made up on Monday, January 21st. 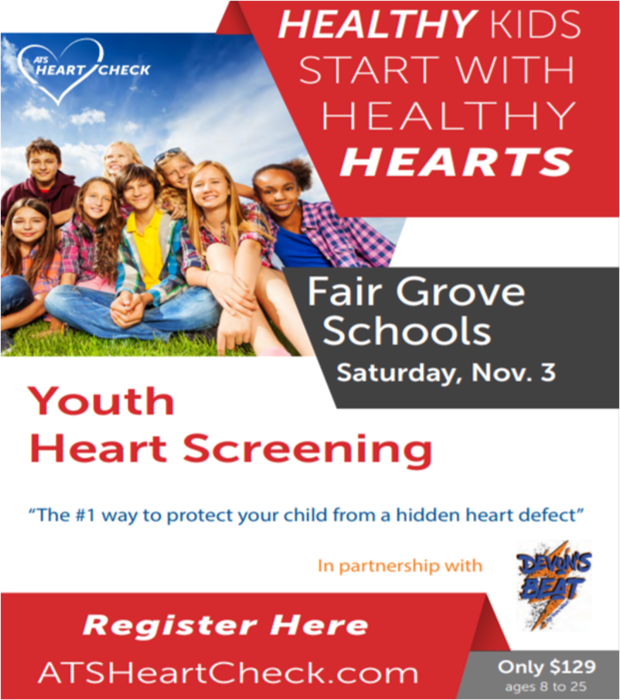 Clever will play at Fair Grove. The freshman game will start at 5pm followed by the JV & V games. The next FG Booster Club Meeting is February 6 at 6:30 - Please consider attending and getting involved. 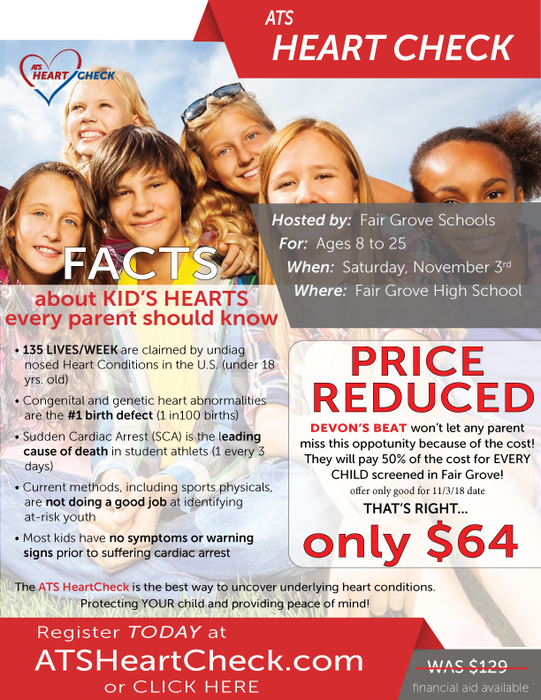 Clever has made the decision to cancel all of their after school athletics and activities for today. Our High School Boys Basketball game vs. Clever tonight has been CANCELED - A make up date will be announced when determined. 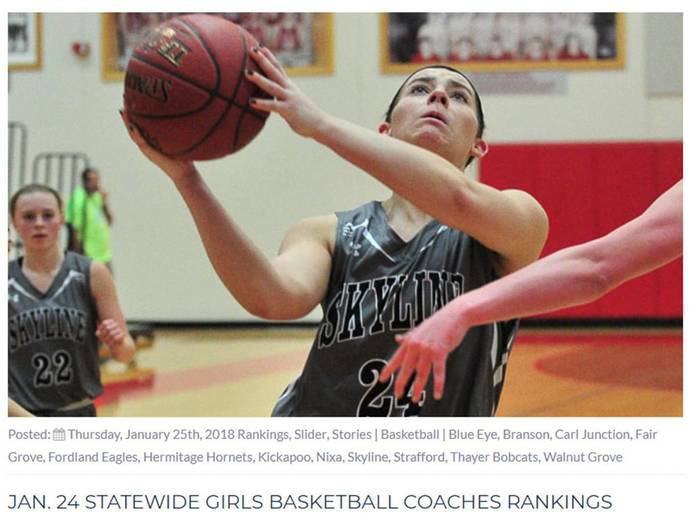 Our High School Girls Basketball championship game of the Skyline Tournament tonight has been moved up to a 7:00pm start time - This game was originally scheduled to be a 8:00pm start, but they have moved it up to try and beat the weather. 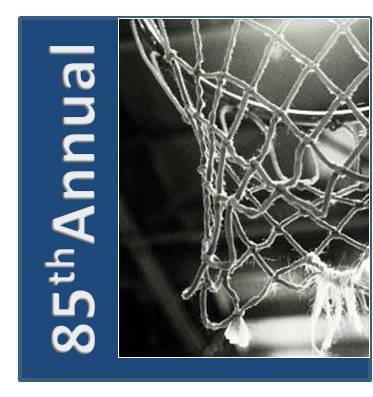 FGHS Boys Basketball vs Conway: Conway will only be able to play a JV/V game on 1/14. We will start the JV game at 6pm and it will be followed by the V game. This is just a reminder that the junior high girls basketball game on 11/26 will be played in the upper elementary gym due to our high school girls tournament going on in the FGHS gym. 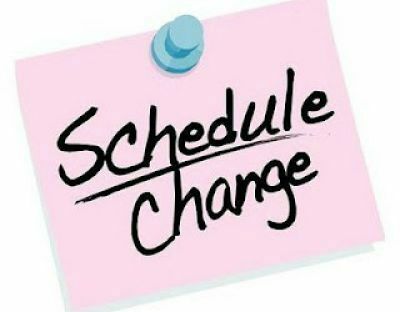 Our Junior High Girls Basketball game at Buffalo on 11/20 has been changed to a 5pm start. Our 7th grade girls will play first followed by the 8th grade game. 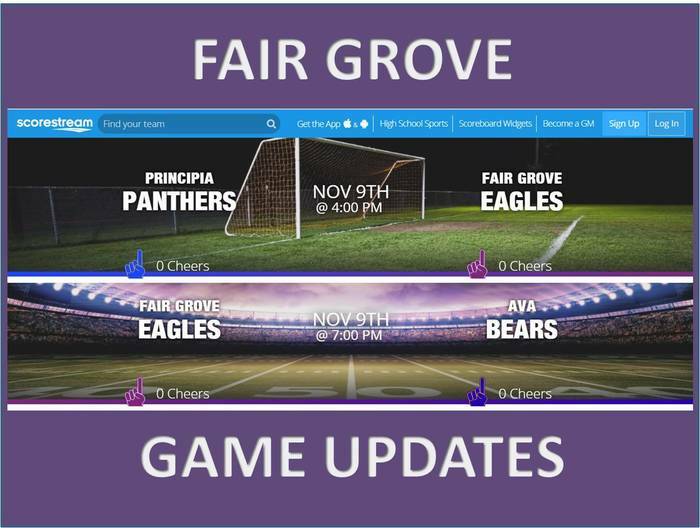 Fair Grove and Miller's HS football teams are both playing for district championships Friday night. 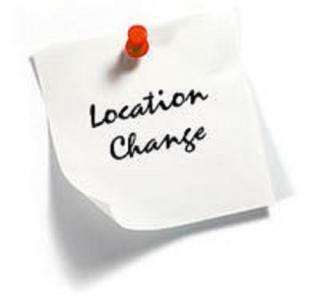 To try and accommodate for those wanting to go to the football games to support their team, our JH girls basketball game will now start at 5pm. We will play the 8th grade game first at 5pm followed by the 7th grade game. 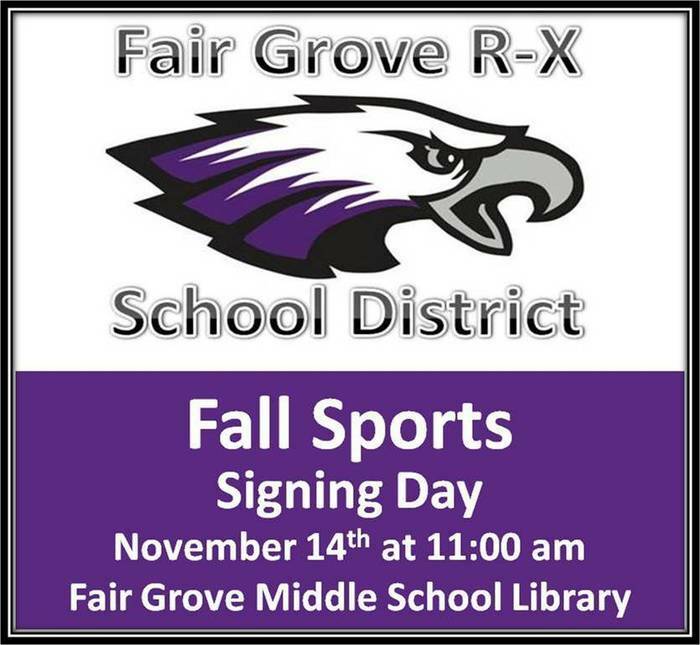 The fall signing day for current seniors who are going to play a sport in college will be Wednesday, November 14th at 11am. 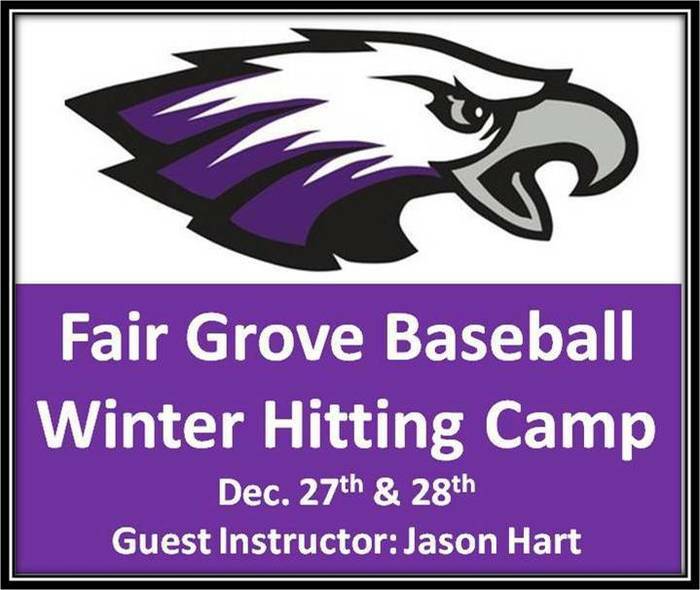 Any student-athlete who is planning on signing needs to notify Coach Overstreet as soon as possible. Our HS varsity football team will be playing @ Yellville-Summit High Schoool in Yellville, AR this Friday, Oct. 19th. Kickoff is scheduled for 7pm. Prior to today, we did not have a game scheduled for 10/19. We feel very fortunate to have found a game this late! Go Eagles! 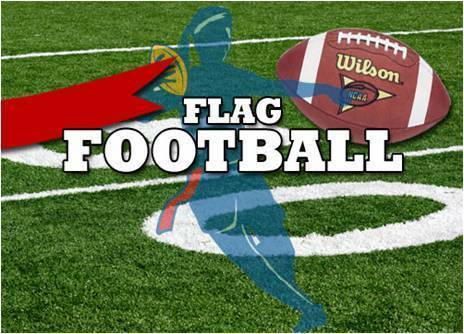 Our FG JV football game at Clever on 10/22 has been canceled. Mr. Overstreet will let us know if we are able to find a replacement game on this date. 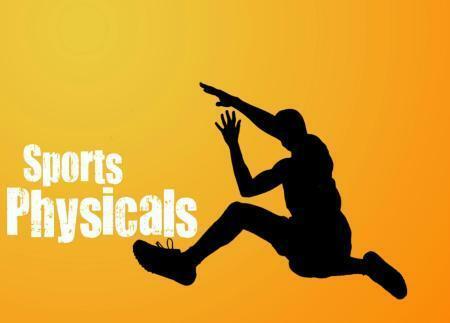 The FGHS SENIOR athletics photo will be Tuesday, August 7th @ 9am on the HS game football field. 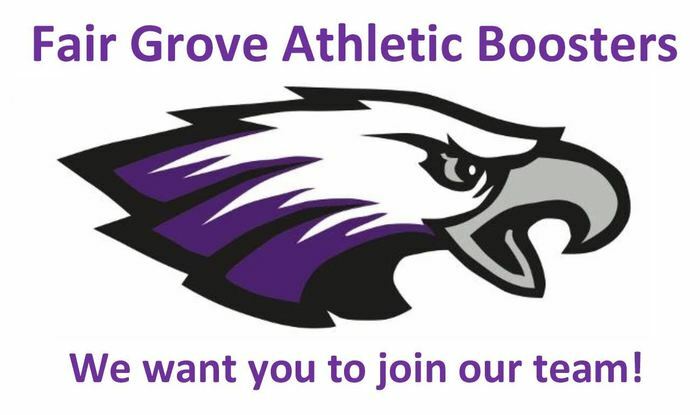 Please attend the FG Booster Club meeting tonight at 6:30pm in the MS Commons. The group will be electing the new officers for the 2018-19 school year. If you are interested in becoming involved in Booster Club for the coming year, please join us! Our HS baseball game scheduled for today, March 29th, @ Marionville has been CANCELED. We will make this game up on Saturday, March 31st at 11:00am. Our softball game vs. Skyline will be made up on Friday, March 30th. We will start the V game at 4:30pm followed by the JV game. Our home softball game vs. Skyline has been canceled for Thursday, March 29th. A make up date will be announced once it has been determined. Our HS girls soccer game on Monday, April 30th originally scheduled to be played at Monett has now been moved to Fair Grove. Our HS girls soccer game on Thursday, March 29th originally scheduled to be played at FG has now been moved to Monett due to the current field conditions at FG. V starts @ 4:30 followed by JV game. Our HS girls soccer game @ Stover will be made up on Tuesday, April 24th. The V game will start at 5pm with the JV game to follow. 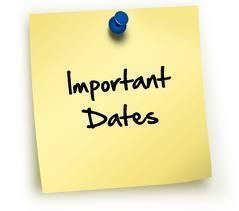 The make up date for our HS softball game vs. Seymour will be Monday, April 16th. The V game will begin at 4:30pm with the JV game to follow. Our HS softball game scheduled for today has been canceled due to wet field conditions. A make up date will be announced when determined. HS girls district basketball at Strafford has been cancelled for tonight and moved to Friday. 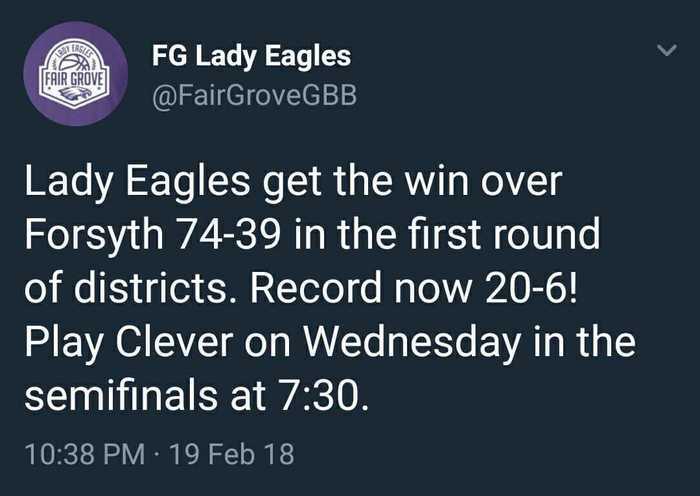 Fair Grove will play Clever at 7:30pm at Strafford on 2/23. Due to the potential of winter weather tonight's HS boys basketball district game @ Strafford has been moved to an 8pm start. Varsity Lady Eagles play at Stockton tonight at 6. There is no JV game. All athletic events scheduled for tonight (Feb. 6th) have been canceled. A make up date for our HS girls game vs. Monett has not been determined. Our HS boys game vs. Pleasant Hope will be made up on Wednesday, February 14th. JV will start at 6pm followed by the V game. 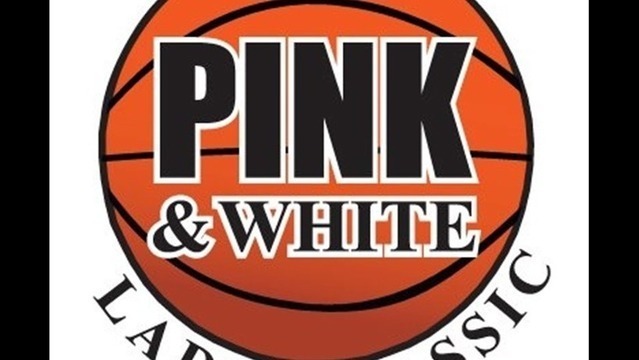 Our FGHS girls basketball game vs. Monett scheduled for tonight (1/15) has been cancelled. Make up date TBD. 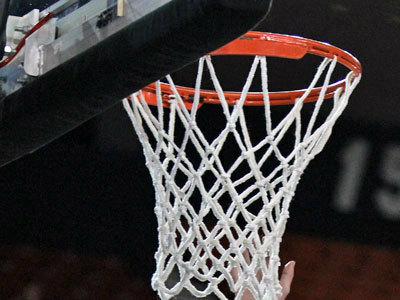 Originally scheduled for Friday night, our HS girls basketball team will play in the championship game of the Skyline Tournament, Saturday, Jan. 13 at 6:30 p.m.
Great tournament FG Lady Eagles! 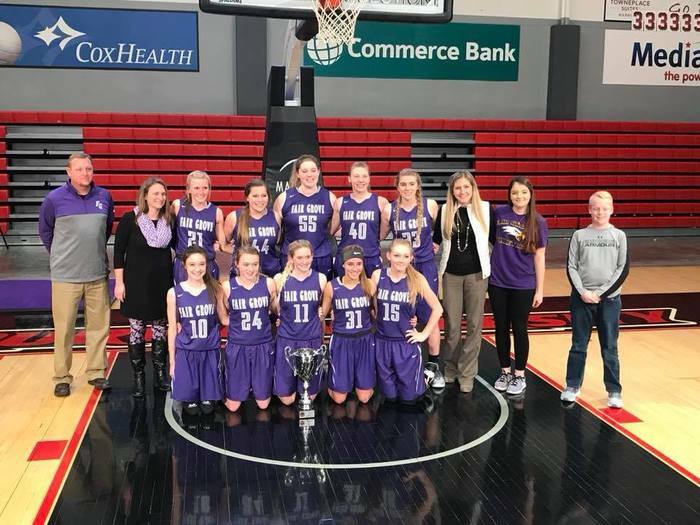 2nd Place finish ties the best finish ever by a Fair Grove team in the Pink and White.